Google Tag Manager to the Rescue! Have you been drowning in a sea of code overload trying to keep track of your tracking codes on your website? If so, your savior has arrived! 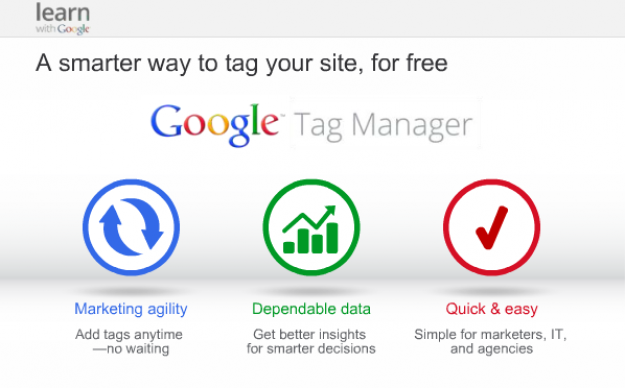 Google Tag Manager is a tool Google released this October to help manage tracking codes by keeping them all in one place. With this new tool you can enter and manage all of your tags in one location, and insert them onto your site with one little snippet of JavasScript code. Monitoring the success of your website or Pay-Per-Click campaign wouldn’t be possible without strategically placed tracking codes placed on your website to see how users are landing on your site and where they visit before – hopefully – making a conversion by clicking a “contact us” button, or buying your product or service. But implementing tracking codes can be a pain. Improperly implemented code can slow down your website and lead to inaccurate reporting data, and every time a new marketing tool comes out you have to retag many parts of your site. Often the worst frustration is waiting for a request to make it from a marketing department to IT – and by the time your tracking is set up, you could have missed out on valuable statistics that could have been used to improve your site and get valuable leads. Wouldn’t it be nice if there was a tool your Marketing department could view and add tracking code themselves? That’s where Google Tag Manager (GTM) comes in. With an intuitive user interface, it makes it easier for marketing managers to get the data they need, and even gives your markets the ability to tag live and publish changes in seconds. You can add tags any time without waiting. It’s easy enough for marketers to make changes without having to bother IT. Automatic error-checking and faster tag load times mean more accurate tracking data. Templates make it easy to copy-past and auto-generate your code. You have the ability to set rules to fire which codes you want. Asynchronus tag loading means tags will load as they’re ready, and in parallel with other page elements. This speeds up your site and prevents the clashing of other tags. Learn about all of Google Tag Manager’s current features at Google. After you create a Tag Manager account you will be able to create accounts and edit permissions for anyone who will need to access the account. You can work with your IT department to implement the solution on your site, and in some cases all it takes is a single snippet of code. You can define sets of tags and rules within Google Tag Manager. Once these are made live, users will receive an up-to-date configuration in their browser where the correct tags will fire. Tags are loaded more quickly as the manager loads them asynchronously, and the rest of the page will keep loading independent of the tags. No longer will a single poorly-performing tag limit your page loading performance. Before you make tags live, you can view them in the preview and debug view of GTM. This allows you to check that tags are firing on the right pages and at the right time. Get your team involved: Talk to your marketing and IT teams and see if Google Tag Manager could benefit your business. Implement GTM: either have your IT team install GTM themselves, or hire an outside source to set up your webpage. Determine your goals for measurement: Decide what key elements you want to measure. With GTM you can easily change these elements in the future. Migrate to the new platform. GTM plans to add additional tag templates as well as other elements including reporting on tag firing, support for A/B testing tags, and more.